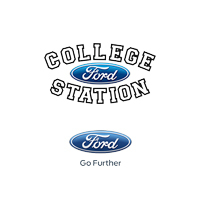 College Station Ford knows the importance of having a healthy set of tires on your car. That is why our dealership has the Quick Lane® Tire & Auto Center. Our talented mechanic staff are ready to make any tire repair on your vehicle. We cater to all types of makes and models, and we carry only top-quality parts. Rest assured that your vehicle is in good hands. If your tires don’t grip like they used to, or if the tread is looking low, you’re most likely experiencing a difference in driving. Your vehicle might feel shaky when braking, or you may even notice a dip in fuel economy. If either of these problems are occuring, it could be time to come see us. We’ll inspect those tires and get to the bottom of it. We can also take care of your vehicle’s scheduled maintenance! We want to make sure this experience is as convenient as possible for you, so there is really no need to make an appointment. In fact, just pop in, any day of the week, including weekends and evenings, and we will get your car back in tip-top shape. However, you can also an appointment online if you prefer. Be sure to look online for any sale specials or deals that we may be having. You will also receive a Vehicle Check-Up Report, so you can track the health of your tires. As an added bonus, when you purchase new or used tires at our Quick Lane® Tire & Auto Center, the following services are usually included at no extra cost: tire inspection for wear and tear, tire rotation, tire installation, tire balancing and mounting. We love to see the people of College Station, Bryan, Navasota, Hearne, and Huntsville smile as they drive away, knowing their tires are road ready.